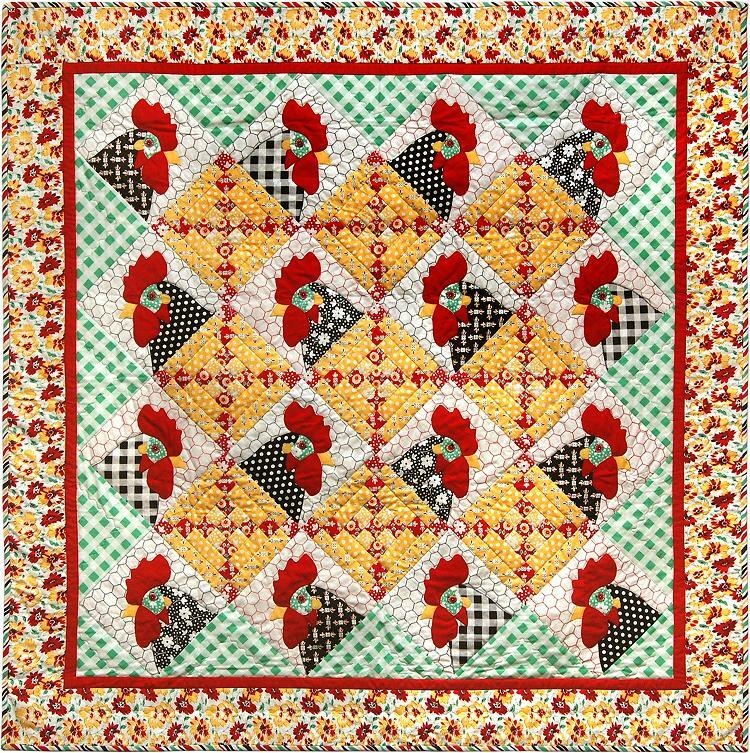 My pal Janet Locey, Head Chick at Henscratch Quilting, recently redid her Pecking Order quilt sample in fresh new fabrics from Maywood Studio. If you like chickens, this is the pattern for you! It’s available on Janet’s pattern page. Be sure to bookmark Henscratch for all your Featherweight needs as well. John Locey, the Ruler of the Roost, is a specialist. And here’s my quilt of the same name. I made this little 18 x 18 wall quilt last year, just putting together some motifs from A Merry Little Christmas to Appliqué and filling in the white space with some cute red and green buttons. I used different prints and widths for side and top and bottom borders, something I’ve become fond of doing. The Christmas cracker is tied with embroidery thread. This one’s machine appliquéd and machine quilted. 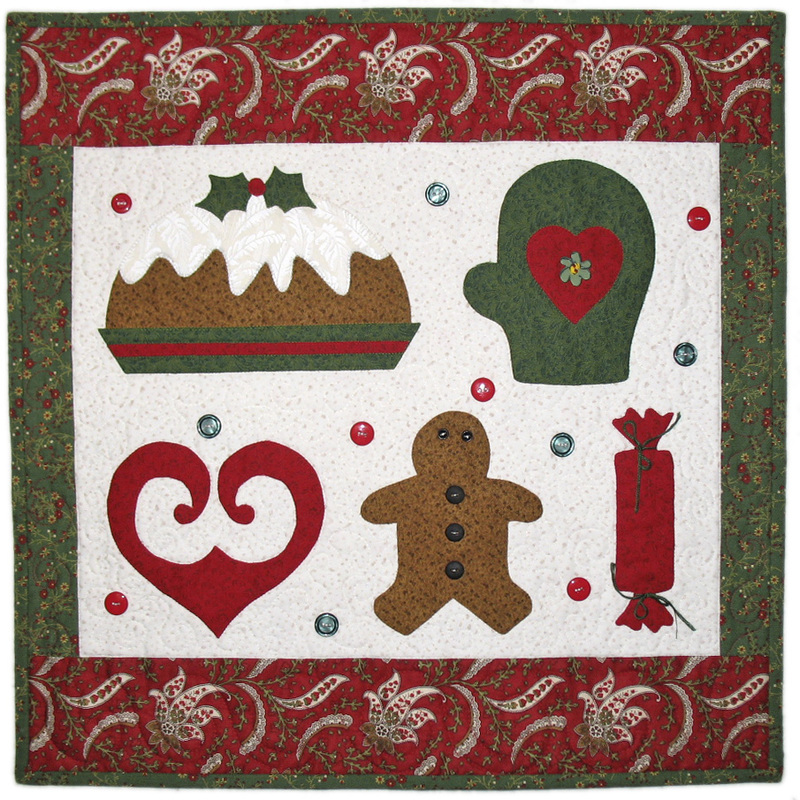 If you’d like to see more Christmassy quilts, click on the ‘Holiday’ category in the left sidebar and that’ll bring up the ones I posted last year. A very happy holiday time to you all! See you next year. Being the ninth in a series of posts about a book proposal, from concept to print. On March 11, 2008, I received an email from the lead illustrator at Martingale. She said that after looking at my patterns, she could tell that they had been drawn electronically, and they looked very clean. She asked if I could send her a sample file from the manuscript so that she could check it out. I sent her an Illustrator file and she quickly replied that my files were “completely usable” and that I should send them all to her. YEAH! That’s what I’m talkin’ about! Okay so since I hadn’t been planning on sending the computer files, they were a little messy. I had upgraded my programs at the first of the year so some files were in CS and some were in CS3. I went through everything and removed extraneous layers, made sure there weren’t any embarrassingly named layers, and pulled them all into CS3 before burning everything to a CD and shipping it off to the lead illustrator. Still waiting to hear from my technical editor. Stay tuned! Kim Jamieson-Hirst of Chatterbox Quilts in Calgary, Alberta, has posted a very nice article on her website giving lots of tips and information about fusible-web appliqué. 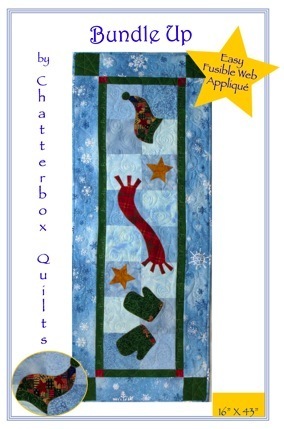 Visit Chatterbox Quilts and click on the Tips and Techniques page. Happy holidays, and bundle up! The past few years, I’ve really been trying to avoid that horrible credit card bill that comes in January. So I’ve been putting my thinking cap on to figure out ways to make gifts instead of buying them. After all, I’m a creative, crafty person, right? Last year I unearthed some small stained-glass quilts that I’d made umpteen years ago, added some more quilting to them, wrapped them up, and sent them to all the relatives. This year I hit upon the idea of making some quilty note cards. A quick Google search found me CardBlanks.com, and I immediately knew what I wanted. A flecked line of blank note cards came in coffee, cream, and sugar LOL! I ordered the sugar. A rummage through my stash turned up a set of pieced borders that had never made it onto a quilt. There were my fabrics, all color-coordinated! I drew some very simple appliqué motifs that would fit on the cards and printed them out in reverse for fusible appliqué. I wasn’t sure whether I needed to use regular-weight or heavy-duty fusible for this, so I started with the regular. Worked fine. My favorite is Soft Fuse; your mileage may vary. For fusing on paper, I didn’t bother with cutting out the interior of each motif (although that does make it easier to get the paper backing off) and I didn’t worry about precise placement either. I just eyeballed it, and used a dry iron throughout. How simple, yet cute. A creative, crafty, handmade gift. I even signed the back of each card. The relatives like that. I slipped four with matching envelopes into some flat cellophane bags that I had had kicking around forever, and voila! Ready to put in with the holiday card, shipping cost an extra Nutcracker stamp. When we were kids we used to ask my Scottish grandmother, “Grandma, what do you want for Christmas?” Or, “What do you want for your birthday?” She just would shrug and reply in her thick brogue, “I don’t need all that I’ve got.” Really, most of the people on my gift list have all that they need and want, for that matter. I think they really appreciate receiving something original and unique, even if it’s just a little something. Now admittedly this isn’t going to fly for the teenaged nephews, but I think it’ll work for just about everybody else on my list. What’s your creative, crafty solution? Being the eighth in a series of posts about a book proposal, from concept to print. Before I get started on the next installment, I have to post the cover! I just received information on how to get it from the Martingale website and I am so excited!!! I absolutely love it. A manuscript doesn’t look like a book. When I make my own books I work in Adobe InDesign, where I write and lay out at the same time. It’s a visual, intuitive way to work, and I can see things take shape as I go. What I’m working on now is a long Word document with no illustrations, no photos, just a bunch of coding where the illustrations and photos are going to be. It’s hard to picture the end result. I mutter to myself, “This is the way it’s done,” and press on. The author guidelines warn that it may be easier to number the illustrations after you’ve finished the manuscript. I try, but I fail. By the time I’m done I think I’ve revised the numbering about eight times. I’m poring over everything in my usual attention-to-detail (it’s a curse) over-achiever manner to make sure that the illustrations are in the right order, they’re numbered correctly, and coded into the manuscript the right way. And then there’s ditto for the separate photo list. Of course my book concept has to be a little “different” than most quilting books so the guidelines don’t cover my scenario perfectly. The author liaison at Martingale is an angel as she fields questions for me and quickly lets me know the answers. For the illustration list (and remember, they only want print-outs), I created an InDesign file and plunked in all of the Illustrator block-pattern thumbnails (which are considered illustrations for coding purposes) plus all of the instructional illustrations, numbered and in order, so I could print them out to send with the manuscript. On a few of the illustrations I balked, because I am no good at drawing body parts. I asked whether I could request photos for that section. The answer came back that illustrations are better because they’re more flexible if changes are needed during production. Okay. Where hands are involved I staged the shots and sent photos instead, pleading help from the in-house illustration staff. After it was all finished to the best of my ability, I sent everything in. I’m done done done! (Yeah right.) The next step is to be assigned a technical editor and wait to hear from that person. Stay tuned!